BAD RAP Blog: Vick dogs: Five years post-seizure. Has the cruelty ended? Vick dogs: Five years post-seizure. Has the cruelty ended? Five years ago this week, the cruelty victims with the uncomfortable label "Vick dogs" were seized and processed as living evidence in the most infamous dog fighting case in animal welfare history. Their rescue from Vick's house of horrors did not signal a happy time, to be honest. Most were relegated to small, dark cages in antiquated animal shelters - still known as 'pounds' in Virginia. Because no one expected them to survive, they were asked to endure a different kind of cruelty for several months until the court order would come down for them to be destroyed. With the exception of the very lucky 'Leo' (who scored with an enthusiastic shelter team) - most never left their kennels for walks or exercise. Vet care was spare or non-existent and enrichments such as chew toys didn't happen. Right: This is where 'Zippy' lived for several months post-seizure. 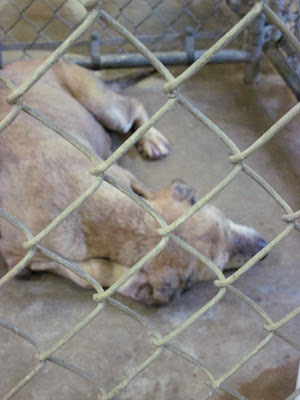 The time period between their seizure (April 2007) and release to rescue (October 2007) did damage to many of the dogs from the case. The now-timid Ginger scampered back and forth like a scared feral cat in the back of her kennel, Frodo pressed himself to the ground when the shelter clatter finally got to him (he's still noise sensitive), and the energetic Uba paced in neurotic figure eights to relieve his tedium. Our stomachs were in knots during the months that this set of dogs was in lock down. While we waited anxiously for the courts to allow us to evaluate, and then, okay their release, we knew the damage done by their impossible conditions could be irreparable in some or all of the dogs. Guardian Master Rebecca Huss worried too, and together we ironed out a game plan to prevent the dogs' impending melt down. Huss created safe passage for then-BR volunteer Nicole Rattay (left, with Iggy) to fly to Virginia and sit with every sheltered Vick dog and offer comfort and measured enrichments. That basic care started November 6 - over six months into their difficult shelter stay. While Nicole reported back on the dogs' progress and challenges, back at home we paced the walls and offered a thousand prayers to a hundred deities for a positive ruling from federal Judge Henry Hudson. That ruling, which allowed their survival and release, finally came to us in October, 2007. Most of the dogs would then wait several more weeks or months to be matched to court screened rescues and leave the shelters. 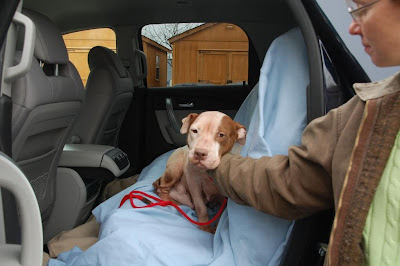 While it's well known that some of the Vick dogs have timidity issues, many assume that Vick's tortures did all of the damage - when frankly, conditions in the shelters took the heaviest toll on the younger dogs especially. Most of the ten dogs we received showed symptoms that mimic post traumatic stress disorder. And some - including Uba, Iggy, Frodo and even agility star Audie - still need reassurances from their owners five years later. Despite that challenge, they function well and some have earned accolades including impressive wins, all thanks to the devotion of their loving adopters - a living reminder of the strength of the human/animal bond. Times have changed though since those nerve wracking days waiting for the dogs' official release. Thanks to the Vick dogs' many post-adoption successes, it's become common place for new victims of dog fighting situations to attract public support, kennel enrichment and rescue help during their wait. District Attorneys now have a pile of precedents and contract templates to help them educate the courts and navigate their release to rescue. In some ways, saving a dog from a fight bust has become an in vogue badge of honor for up and coming rescue groups - deservedly so. It's still extremely important to move the dogs through the process as "evidence" as quickly as possible, but in some cases we still lose dogs -- or rather, the dogs are still losing the battle during the wait. In Gadsden County Florida in July 2010, the conditions in a rural shelter were so horrific that while we were at the shelter trying to sort out the needs of the seized survivors of a fighting case, the dogs literally dropped from poor conditions including dehydration and died at our feet. 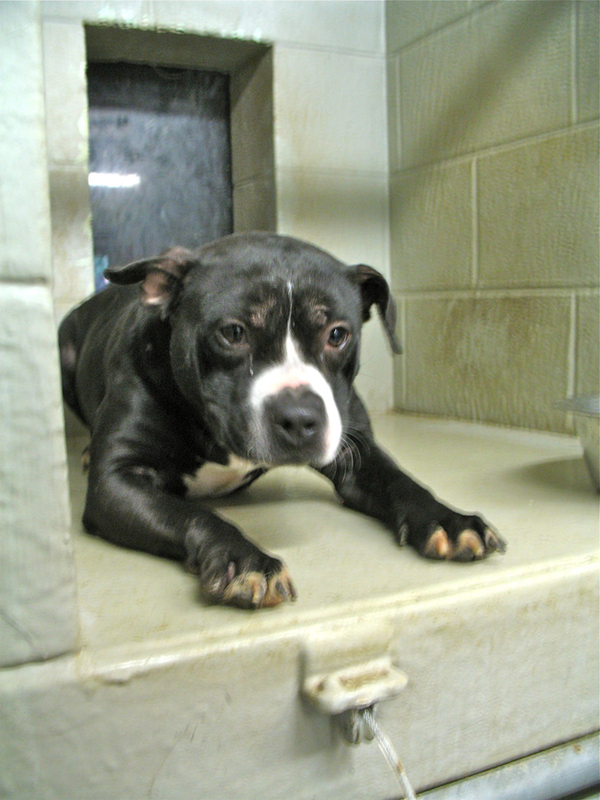 Shelter staff shrugged - they were "just pit bulls" after all - and we had to wonder if this particular group of dogs had better odds with the dog fighter than they did with the shelter. Despite the best efforts of the responders, only three dogs survived the conditions - BR's Winnie being one. As an addendum: Both local authorities and humane reps were depressingly unresponsive to news of the suffering and conditions and the Gadsden County Shelter remains one of the most decrepit places a dog can find himself. Much, much work needs to be done in this part of the country! Right: This is one of several dogs who died of dehydration and disease due to neglect in the antiquated animal shelter of Gadsden County Florida. Louisiana is one place where state law regarding the disposition of fighting victims is so vaguely worded that the dogs' fates typically fall back on any given judge's personal opinion of dogs and/or pit bulls. This particular group of dogs was incredibly lucky. Because Richland County doesn't have an animal shelter, some were boarded temporarily at a vet's office and others lived in horse stalls on a volunteer's property while waiting out the court's ruling. That style of confinement and - especially - the daily interaction it provided with caretakers may be a large part of the reason all four dogs were so happy and well adjusted when they arrived in our program. We haven't noted any signs of PTSD in these victims and they are fast tracking towards new homes as a result. Right: Tallulah and Gris-Gris in BADRAP's 'barn dog program.' Every dog from this case found rescue help. The first organization to raise a flag over the compelling issue of kennel conditions for canine victims of cruelty was the National Animal Control Association. Then director Mark Kumpf stressed the need for fast action to design the dogs' disposition in this interview: "Agencies should seek custody of any animals seized through a legal forfeiture process established for that purpose and, if custody is gained, them make prompt arrangements to evaluate each animal individually to determine if it can be placed. Other animal organizations need to be ready to immediately support these actions and assist with locating appropriate placements." More on NACA's stance on the treatment of cruelty victims. Those words ring too close for comfort when we consider Rose - a "Vick dog" who suffered terribly during her shelter stay post-seizure. Rose was not provided with vet care to treat an internal injury (possibly a tumor - we still don't know for sure) and her health concern grew into an unaddressed crisis situation. Rather than find a new life, she was euthanized shortly after her release to end the suffering she'd been living with for so long. Her face still haunts each of us who met her. Photo: Berenice Clifford of Animal Farm Foundation with Rose. 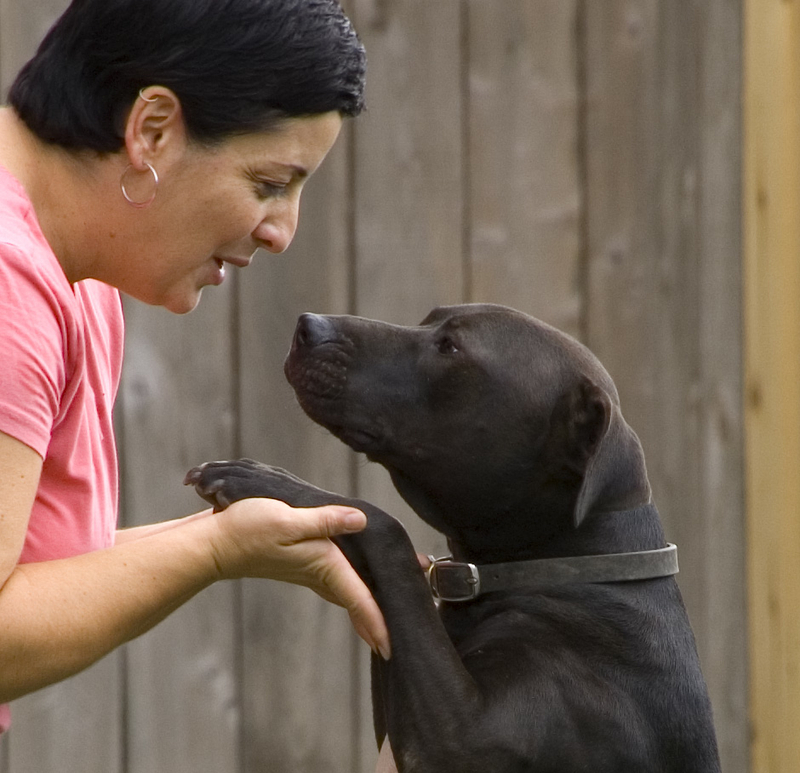 We've learned so much from the Vick dogs, and their lessons have changed us forever. One of their biggest lessons though tends to be forgotten in the excitement of their adoption success. We'd love it if every time readers hear of a new batch of victims rounded up from a cruelty case, you would consider the Vick dogs' long and difficult post-seizure experience and ask, "What's being done to keep this latest set of dogs comfortable, vetted and sane while we wait for help to arrive?" The answer to that question could make all the difference in whether the cruelty they suffer ends for good the moment they're seized by authorities -- not several months later, after they're finally released to rescue. NOTE: With all due respect to the incredible people who came together to seize the "Vick dogs" in April 2007, we will be celebrating the five year anniversary 'happy style' in October -- on the date that the federal courts finally waved them out of the shelters and onto freedom. What a HAPPY day that was! SO MANY PEOPLE worked so hard and so tirelessly for these dogs. It really does help to restore one's faith in humanity. Bless everyone to did anything--even if it was just saying a prayer. Bless those dogs. Great blog! I had no idea the Vick dogs were treated so badly in the shelters, it really breaks my heart. I really hope we can educate the public about this breed because I believe these type of dogs are often neglected in shelters. I own a rescue pit-bull and she is the best dog ever! I like how you are able to use the Vick case as leverage in subsequent situations. The name recognition must help in that you do not have to explain who the "Vick dogs" are and can go directly to the lessons learned and how they apply to the current case at hand. Way to go using that to aid other dogs in need! I think the work you all do is amazing and it brings tears to my eyes that people can be so cruel and I find Michael Vick a disgusting human being and only wish he would be treated as he treated these beautiful dogs. 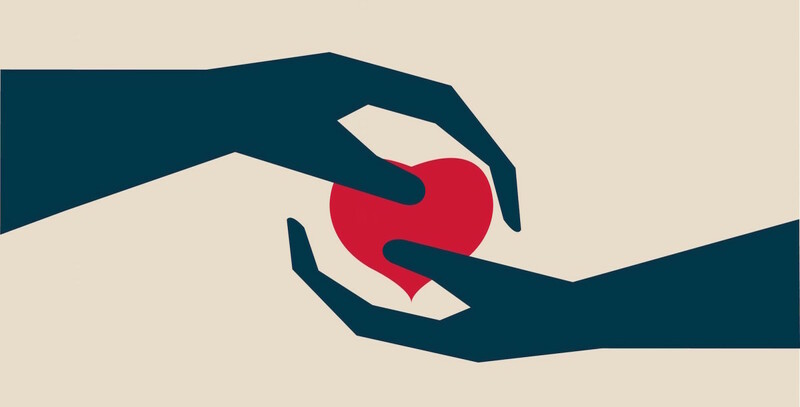 I am grateful that you all do what you do as you make this world a better place. Thanks for this! I've been wondering what happened to the V Dogs post-seizure. I've read there were about 66 dogs seized in April 2007, but only 49 were evaluated in October. Is it safe to say the difference is due to euthanasia due to illness and any euth orders that came through? Thank you for the education. (please excuse typos-typing this through tears). Star. Winnie. ughhh. I did not know these stories before. Thank you and your peers for all that was/is being done for the these victims. It does make me sick to think about what these dogs go through. But it also makes me sick to see ads in the paper/craigslist "Pit bull pups for sale" or "must find home for 2 yr old Pit, have new baby." To think about the seemingly increasing number of "Pit Bull Mix" dogs due to irresponsible owners failing to spay/neuter-thus potentially putting the offspring in danger of ...well we all know. It is almost as if the fight rescues have an advantage over the local strays. It must be so frustrating for you that you "Can't be everywhere/do everything/save every dog." It makes me wonder why dog-loving celebrities and wealthy folk do not go without their designer this and that and pour their wealth into "franchising" dog rescues such as Bad Rap. Funding legal help. Coach bag or happy, live dog? Manolo Blahniks or helping to end BSL? Excelent story ! Thank You for thhe up-date !! Another great blog. Thank you, Donna. No one tells their story better. I know my life has changed dramatically as a result of that case and I am so much the better person for it. Another excellent blog. I am more than happy to celebrate every day all you people who fought to save, help and adopt Michael Vick's surviving dogs and again, thanks for reminding us all there is still a long way to go in making it right for these victims. Also, reminding us that still a lot of innocent victims fall through the cracks like poor Rose when they end up in the wrong animal shelter. Some of these horrible animal shelters should have the title shelter removed from it and changed to animal hell for these poor innocent dogs. But you did remind us again that so much HAS changed for the better for some dogs but we all have to do what we can in our own areas and globally to keep vigilant of any animal cruelty that we know is going on and to speak up against it and make things better for animals overall. It is not as easy for some of these horrible animal shelters or dog fighters or any other animal abusers to hide what they are doing because of the internet and I am thankful for that. We will get there and make the world better for these innocent animals who all deserve so much better from all of us. I can't wait to celebrate big in October also. I celebrate every day though all you amazing people who did right by these dogs and the amazing, resilient dogs who still love people and persevere after what they went through. I feel privileged to have witnessed the miracle of saving the Vick dogs and never forgetting Rose or all the unnamed victims of horrific animal abuser or horrific shelters who have and still fall through the cracks in trying to save them all. WE evaluated 49 of Vicks' pit bulls and there were originally 53 confiscated. The others mysteriously died in a VA shelter, so the rest of the dogs in that shelter's "care" were moved to a the Hanover shelter - where they never left their cages, not even for cleaning - a step up though I suppose. The other thirteen dogs were hunting beagles that were likely being boarded. No one claimed them for obvious reasons, but they were rescued and adopted out. I forgot to mention his Presa Canario and Rottweiler. I took both of them out for walks and really fell for the Presa, he was a very sweet, gentle giant and didn't even have guarding behaviors after many months in a kennel. The Rottie was pretty aloof, but loved being out of his kennel for a bit. So make that two less beagles for the head count. Tim, didn't the Presa belong to the gardener? I thought I remembered reading that in 'The Lost Dogs'. Correct me if I'm wrong, but didn't he also step up and claim his dog? My favorite part of Lost Dogs is the appendix that tells the followup stories of where the dogs are now. What I find exciting is that Jim will have to keep updating it since more of the Best Friends dogs keep earning their CGC's! So much for the idea that sanctuary is just "warehousing" obviously these dogs are being tended to. And I think your comments on quality of care apply to all kinds of animal sheltering in this country, don't stop with animals held for court cases. The eleven Vick dogs at WARL were treated like royalty... remember, sausage McMuffins for the holiday? My heart breaks for Rose and that poor dog at the shelter who died of dehydration in Florida. I will be writing the animal control there as I am horrified. Thank you for all that you do. It's with a mixture of tears and smiles I read your blog. Question: Do you still have Gunther? I remember running into him and Tim and think about Gunther occasionally he was such a lovely dog. It's too bad the Humane Society of the United States didn't learn from this case about what to do with the Wike's County pit bulls. Instead of evaluating each dog and letting rescues/fosters care for them, they had 100+ dogs killed. The majority were newborn pups too. I have adopted a "bait dog". . She was only 7 months old. . Scarred & bloody when I found her toed to a tree in 97 degree weather. . She was skin and bones. Now. . I have to fight for my place in my bed. She gives up the pillow if she feels like it! I have never owned a gentler or more loving pet! Pit Bulls Rock! Thanks for the very informative post. Just wanted to let you know that a female over- bred stunted female covered in sores, showed up at my daughter's inlaws' home in dog traveling distance from the Vick compound. This was several months following the Vick Compound arrests. This dog named Lucy, was adopted by a friend who provided excellent care for this sweet rescue. Within months she was spayed, her wounds were healed, her shots, etc. were done, and she was learning that she wasn't supposed to hang out on the sofa. I think Lucy is a Vick dog who managed to escape. She is a very lucky dog. I feel honored to have been involved in her rescue. I don't know how you guys manage the emotions in the work you're in. I'm sure it helps that you can point to actual examples where your efforts have both individually and globally improved the plight of these dogs. It's moving forward, despite horrible setbacks like the terrible Maryland Court of Appeals ruling. Just happened upon your blog and I know I'm gonna be stuck here for hours reading *everything*! 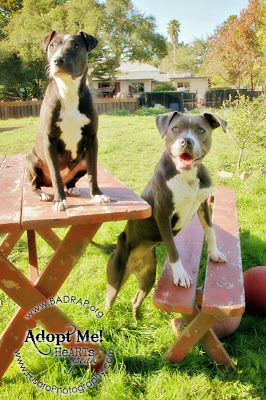 We are a proud two-pitbull family (one male Land of Giants, 144 lb baby; one female rescue, 59 lb firecracker) who make it our business to be ambassadors for the breed. Looking forward to catching up with all the stories here; thanks for all you do! I just watched the PBS show from July 2011 online. It was great to learn about your work and then come to your site for a more recent update. The fact that you emphasize education as well as rescue is so smart - thank you for all that you do! It just makes me so sad that people treat their pits so horribly. They are wonderful companions! Today Lennox lost his life - for being a "pit bull". How do we stop the killing? I always hate hearing about how badly pit bulls are treated in shelters and elsewhere - simply because they're "pit bulls". I have 2 myself and once my children are grown, I'm sure I'll have a few more. I've had all types of dog breeds during my life and my pit bulls have ALWAYS been the friendliest and most loyal - it's all in the way that they are brought up. I really wish more people would give them a chance to see what good dogs they really are. Thank you for the article, it was very informative. I have been following the stories of the Vick dogs since they were rescued from Bad Newz Kennelz. I just recently read The Lost Dogs by Jim Gorant. The stories of the dogs (Rose, Sweet Jasmine, Seven, Bonita, Red, Leo, and most recently Ellen Belly) who have passed away since their rescue haunt me. The stories of the dogs who have come so far and found their forever homes make my heart happy. Still others, who have yet to find their forever homes, and Lucas and Meryl who have been court ordered to live out the remainder of their lives at Best Friends make my heart hurt for them. I applaud everyone who had a hand in helping all of these dogs. I hope that at some point in the near future that the "shelters" step up and improve the conditions so that future dogs have the hope of a better life. 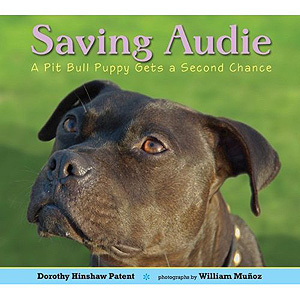 Because of these stories, I am going to be volunteering with a local pit bull rescue starting this week. Thank you, Bad Rap and all the other organizations and people who have brought such awareness to the public regarding this misunderstood breed. I saw the group photo of the former Vic dogs and decided to look up the Bad Rap site.I noticed their is a link to the PBS show"The Dogs are all Right"The first few shots of the Vic compound horrified me.Now some may feel the comparison absurd but I couldn't help think "This is a concentration camp for dogs"The horror and brutality that these beautiful animals endured(and of course there were many victims as well)was a terrible thing.If the dogs could tell their story through their own lips the comparison would be very similar to that awful time in mankind's history.To them Mike Vic and his unfeeling cohorts would have seemed like Hitler and the SS officers who ran those camps.That truly was a shameful time in human history and what Vic did and so many others who engage in dog fighting again a shameful time in dog history.Thank You for giving these dear creatures the chance to have a better life. I have a rescued pitty and she is the most pleasant dog you could find, such a happy little girl she is all the time. I live one county over from Gadsden County, FL. Conditions have not improved. There us no public adoption. It is merely a hold and die or kill facility. Four of the Michael Vick dogs went on to become certified therapy dogs. I wish that could be mentioned in every article about these dogs. I am a veterinarian that worked with one of the shelters housing some of the Vick dogs, some of the pit bulls and quite a few of the beagles used as bait dogs. Sure a shelter isn't an ideal place, and it would be great for the court procedures to be processed quickly. But the dogs at the shelter I worked with were cared for. I saw and treated a lot of them for various health issues. All shelters are not created equal. We must work on legislation to improve situations post seizure. Many times abusers are convinced to surrender these animals. It should be a law that evidence of abuse automatically means the dog is relinquished to proper shelters for adoption. you'll hear about a raid or bust then want to find out more but all you get is a paragraph or so...recently there was a bust and the aspca handled it but all they posted was a paragraph and no details whatsoever.